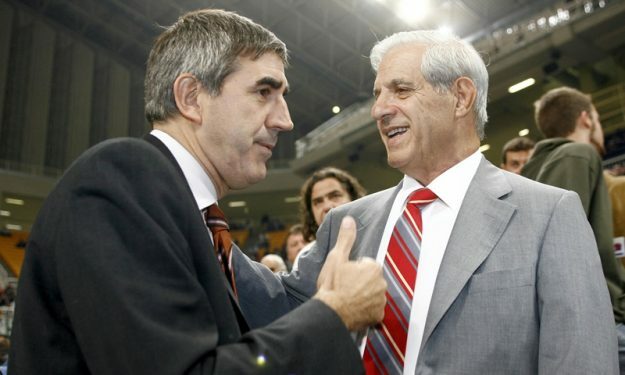 Euroleague Basketball joined the mourning for the death of Pavlos Giannakopoulos, one of the main figures for decades in the European basketball club scene. Longtime rivals like Olympiacos, Barcelona and many other EuroLeague and Greek clubs have issued similar press releases. “Euroleague Basketball bows its head upon learning of the passing of longtime Panathinaikos Athens executive Pavlos Giannakopoulos. A giant of our sport, Pavlos Giannakopoulos, together with his brother, Thanassis Giannakopoulos, was the steward of Panathinaikos for a quarter century from 1987 through 2012. Pavlos Giannakopoulos served as the basketball team president throughout that period, either alone or together with Thanassis, until Pavlos Giannakopoulos’s son, Dimitrios Giannakopoulos, took over in 2012. With Pavlos at the helm, Panathinaikos won six EuroLeague crowns, the 1996 Intercontinental Cup, 13 Greek League titles and nine Greek Cups. His loyalty to players and coaches and commitment to excellence established Panathinaikos as a club that elite players across Europe long to play for. His excellence as basketball executive was saluted by Euroleague Basketball in 2011 when he and Thanassis were named joint winners of the Executive of the Year award for the 2010-11 Turkish Airlines Euroleague season. Pavlos Giannakopoulos’s love for Panathinaikos knew no bounds and his desire to see the club among the best in basketball led him to recruit world-class stars from around the world, with the likes of Americans Dominique Wilkins and Byron Scott; European legends Dejan Bodiroga, Dino Radja and Sarunas Jasikevicius; and the best of Greek basketball, such as Fragiskos Alvertis, Dimitris Diamantidis, Nikos Galis and Panagiotis Giannakis all starring for the Greens at different stages. Even after Pavlos Giannakopoulos resigned as Panathinaikos president, he cast a giant shadow and remained an influential figure both within the club and with the fans. All those at Euroleague Basketball and our participating clubs salute him one final time for his many contributions to European sports in general and to basketball in particular. May his memory be a blessing to his family”.